WEST LAFAYETTE, Ind. — A newly opening exhibition by Purdue Libraries highlights the physical growth and evolution of the university's West Lafayette campus from its establishment in 1869. The exhibition, "Building Purdue: 150 Years of the West Lafayette Campus," is on display through Dec. 14. 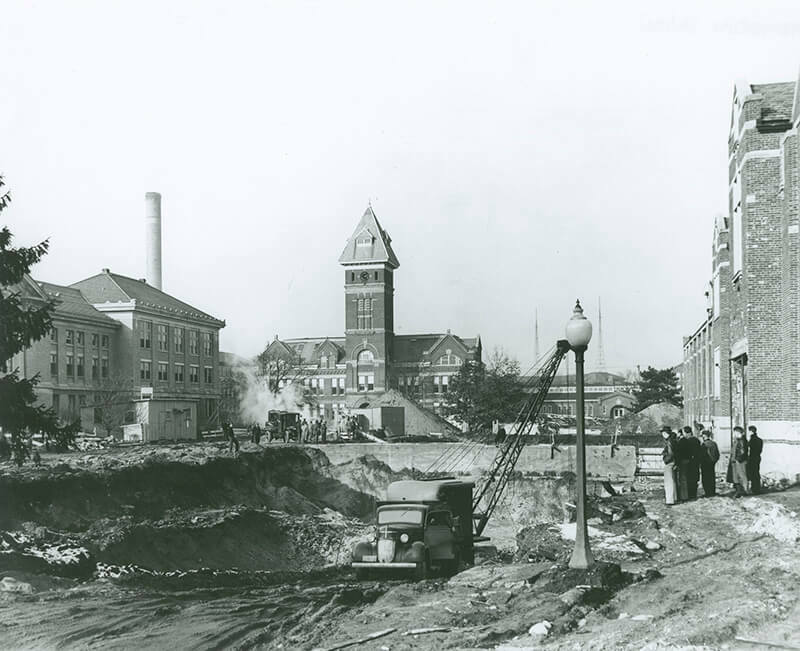 Digital archivist Neal Harmeyer, who curated the exhibition, says it shows selected maps, photographs, documents and artifacts that tell the story of campus -- with a focus on its construction -- as Purdue nears its sesquicentennial. "Prominent topics are the fire of Heavilon Hall that inspired ‘One Brick Higher,’ the creation of the Purdue Memorial Union, the university during and after the world wars, and the ever-changing nature of the campus all Boilermakers call home,” Harmeyer says. The exhibition, presented by the Archives and Special Collections library, shows how construction both followed and enabled great leaps such as the determination to excel in engineering and agriculture as Purdue pursued its land-grant mission. The display is in Archives and Special Collections, on the fourth floor of the Humanities, Social Science, and Education Library (commonly known as HSSE) at the west end of Stewart Center. Visitors enter through HSSE. Exhibition hours are 10 a.m. to 4:30 p.m. Monday-Friday, and it is free and open to the public. The exhibition helps Purdue Archives and Special Collections, a division of Purdue Libraries, kick off Purdue University’s Sesquicentennial Campaign, 150 Years of Giant Leaps.